THE Kendleshire is the place to go for tees and teas – not to mention breakfasts, lunches and dinners! As well as a challenging 27-hole golf course set in the sweeping countryside of Coalpit Heath, the club – which is open every day of the week throughout the year – offers good food daily. 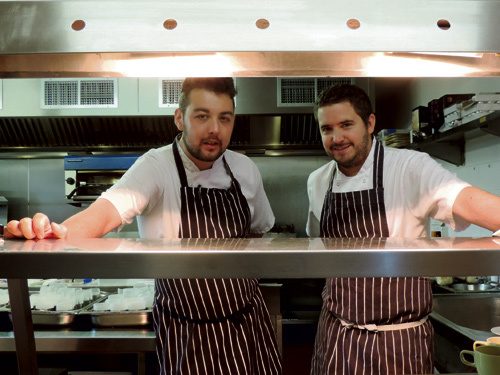 Head chef duo Richard Guest and Mike Pattinson pride themselves on serving freshly prepared food, focusing on freshness and simplicity. They go to great lengths to source quality produce, starting close to home with herbs and fruits grown in the Kendleshire’s lush grounds. The menu changes according to the seasons and the weather. The kitchen team have a great relationship with their butchers and fruit suppliers, talking to them about prices and making adjustments so that customers don’t have to pay through the roof for freshness. The chefs also speak to their fishmonger every Friday to discuss the catch he is going for and he tells them market trends so they can plan their menus. While the produce is local, the contemporary British meals the team create are inspired by culinary experts from far and wide. The chefs look to the London food scene for modern twists on traditional favourites and for new ideas. If you are visiting, don’t be afraid to call into the kitchen. The chefs are always pleased to talk about what they are cooking and to share ideas. There is a real buzz among the team and a passion to build on an already strong reputation. There’s something for everyone at the Kendleshire. The patio dining area offers an friendly informal space overlooking the 18th hole. You can enjoy a warm cookie or freshly made barista coffee from the bar area, as well as sandwiches, salads and other homemade classics. The signature burger made from West Country beef is not to be missed. Award-winning sausages from Don Hayes in Staple Hill feature on the club’s breakfast menu, while the centrepiece of the three-course Sunday lunch is succulent meat from Bartlett’s of Bath, accompanied by “real gravy like your mum used to make” and monstrous Yorkshire puddings. This is served in the function rooms, which are converted to a restaurant with a view overlooking the golf course. You don’t have to be a member to visit the Kendleshire, so why not take a look?